Prior to joining the firm, Attorney Venkat served as a law clerk for the Honorable William G. Young in the U.S. District Court for the District of Massachusetts. In 2016, she completed her master’s degree in law (LL.M. ), specializing in Intellectual Property, from Boston University School of Law. 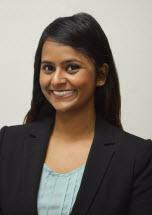 Ms. Venkat is admitted to the bar of the State of New York and is also licensed to practice law in India, where she worked as an attorney on civil and commercial disputes from 2014-2015.